William Lancaster Alexander (1820-1910) was born and brought up in Liverpool. On the death of his father, a Cumbrian, he inherited the Estate at Shatton on the extreme northern boundary of Lorton Civil Parish. He farmed there for many years. In 1857 he married Frances Armistead (1815-1890). She was a wealthy woman, owning much property in West Cumberland. She was the sister of the Revd. William Armistead the incumbent of Lorton for 38 years until 1864. Soon after their marriage, the Alexanders moved to Oakhill in High Lorton. The family were great benefactors of the village. Although they didn’t have any children themselves, they had pleasure in having children around them. William Alexander was one of the Managers of Lorton School from 1860 to 1910. Every year they would give garden parties for the children at Oakhill. Alexander would regularly hand out prizes to the children and Frances would give prizes to the teachers and provide books for the school. He was also involved with the school in Embleton and Fairfield school in Cockermouth. He gave money over the years for improvement of the school buildings and was the main instigator for the building of the Masters house, now known as School House. As a member of the Committee chaired by A.J.S. Dixon, he not only organised the raising of money for the house but contributed a large sum himself. A plaque in memory of William Alexander was put up in the school in 1997 by Mr Bell, the Headmaster at the time. The Church of St Cuthbert stands alone between High and Low Lorton. The small building next to the Church was the Sunday school until it was sold in 1980. It is now a holiday home having been dedicated to Robert Bridge from Lorton Hall in 1857, and enlarged in 1887 for Queen Victoria’s Golden Jubilee. The old Vicarage built in 1892 is along the lane to the north of the church. It was in use until the 1960s when the vicar of Lorton, The Revd. James Woodhead-Dixon, decided to buy Lorton Hall when it came up for sale and to move there. The Vicarage was sold in 1985 by the Church Commissioners and is now a country guest house. Lorton Hall, situated in Low Lorton, abuts onto the banks of the River Cocker on its western side. It has a Pele Tower, albeit built in 1845. It is recorded that in the 1300’s the Winders, who were a prominent family in the area, were the owners of Lorton Hall and continued there for about 300 years. Anthony Joseph Steele Dixon (1862-1909), a Captain in the Royal Cumberland Militia, was the younger son of Thomas Dixon and inherited Lorton Hall on his father’s death. He married Florence Brockbank in 1882. A.J.S. Dixon set about enclosing his property at Lorton Hall with the high wall existing today. He demolished buildings at Lorton Cross (the cross roads, at the corner of the property) to improve the view looking up the valley towards Buttermere. Over time, he increased his land holding in the district. He bought The Brow and Bank Farm above Whinfell in Blindbothel on the west side of the River Cocker in order to secure the water supply to Lorton hall which was piped under the river. Dixon and his wife were very much involved with others whose philanthropy greatly helped the families of Lorton. He was Chairman of the Committee responsible for the building of the Master’s House. It was dedicated at the Golden Jubilee in 1887 and known as Alexander House, before it came to be known as School House. Mrs Dixon was the Hon. Treasurer of the Committee and devoted much of her time and labour in getting through a large amount of correspondence. In 1903 a new east window, a bequest from Dixon, was installed in St Cuthbert’s Church. The window was made by Mayer of Munich. Anthony Thomas Steele Dixon (1900-1962) inherited the Lorton Hall Estate following his father’s death. He continued to live at Lorton Hall until he put up the Estate up for sale in 1947. The Dixon family continued philanthropic work. Mrs Ethel Florence Nancy Senhouse, younger daughter of A.J.S. Dixon, gave land to the village in High Lorton on which the tennis court was built for the use of the village children. And in 1935 the Dixon family gave the village the playing field which is situated behind the tennis courts. During Second World War the servant’s quarters at Lorton Hall were made available for evacuee children from Newcastle. They had a cook looking after them. Wilson Cook (1863-1928) and his wife Sarah Jane (née Porter) (1870-1931), with sons Isaac (b 1899) and John (b 1900), moved to Armaside Farm in 1901 and took on the tenancy. They had six more children, each born in Lorton, Margaret the youngest being born in 1913. She has clear recollections of her early childhood which paints a picture of life in Lorton Vale in the 1920s. The children all walked to Lorton School each day. A girl aged seven from a farm in High Lorton was responsible for making sure the two eldest, Isaac and John, got to school safely, when they first started at the age of five. The children wore clogs to school filled with straw to keep their feet warm when it was cold, and would take their lunch with them. They wrote on a slate with chalk. Mr and Mrs Oglethorpe were the only teachers and they lived in School House. Margaret remembers playing with a hoop and stick and with a bouncing ball in the play ground. The older boys did the milking before going to school. Last thing at night, Wilson Cook would take a lamp and walk round the stables and barns. They used a pony and trap to go in to Cockermouth. Isaac and John would ride there on the back of a horse. When riding to Lorton and back, the horses would drink out of the trough by Cass How Wood. Washing day was once a week. The clothes were washed in large coppers. There were clothes lines outside, but large items were laid over stick heaps and bushes. Log or coal fires were only lit in the bedrooms if someone was unwell. There was no indoor bathroom or plumbing – chamber pots were under the beds. The three boys all shared a double bed which had planks down both sides. A dressmaker came to the house every year and lived in for a couple of weeks. She also turned sheets and made pillowcases with linen buttons so they could go through the mangle to wring out the water before drying. Mr and Mrs Armstrong were neighbours living in Armaside House. Margaret remembers going over to the kitchen where the cook would give her a piece of cake. She remembers always getting a Christmas present from Mrs Armstrong and still has a book given to her one Christmas. The Cook family would visit friends in Low Lorton by horse and trap with oil lights lit if necessary. The children were invited to Lorton Hall by the Dixon family at Easter to look for easter eggs in the garden. Margaret remembers rolling pasche eggs down the hill in Butter Bowl (the field on the opposite side of the road from Armaside.) They made the pasche eggs by covering eggs with flowers and onion skins, wrapping them in cloth and boiling them to give a decorative effect. In an article in The Cumberland Pacquet of July 1918 “Cracks with West Coast Farmers”, Cross Fleury visited the Cooks at Armaside Farm. He reported that Wilson Cook was farming 164 acres at Armaside and 94 acres at Shatton Hall, plus 300 acres of fell land totalling 559 acres. It was a stock and dairy farm. Shorthorns were at Armaside, including a prize bull, and Irish cattle were at Shatton. Five working horses were reported as being in the stable, three in foal and “a promising couple of two year old horses plus a promising four year old mare” in a loose box. The poultry were Plymouth Rock crossed with Leghorn. A couple of pigs were fed on the refuse of the farm and dairy. Armaside was noted as a big sheep farm too, with a large flock of Herdwicks, and a small flock of white faced or crossed ewes at Shatton Farm. Oats, potatoes and mangels were grown. The Dairy had the latest untensils and equipment, ‘Loaves of butter’ being made up for sale. Wilson Cook is recorded as speaking in the highest terms of his landlord, Mr John N Dickinson who owned both Armaside Farm (which included Harrot Fell) and Shatton Farm. In the newspaper article Cross Fleury congratulated Mr and Mrs Cook on the results of their labour, and considered them to be both born farmers. Stanley Dickinson Stanley-Dodgson, who died 1946, inherited the farms at Armaside and Shatton Hall from John Norman Dickinson of Hames Hall in the 1920s. He also owned Darling How. He was land steward to the Earl of Lonsdale. Stanley-Dodgson was another member of the community involved with Lorton school. One pupil at the time remembers him giving crackers to the school. Another pupil remembers Stanley-Dodgson’s bailiff who ran the farms arriving on horseback in very smart attire with black shiny boots, walking round the building and tapping on the window of a classroom to attract the teacher’s attention. In Cockermouth, Stanley-Dodgson was to be seen every morning in his pony and trap wearing a black silk top hat on the way to the railway station to catch a train to Penrith. He and his wife remained at Armaside House until his death in 1946. The Dickinson and Stanley-Dodgson families were the owners of Armaside for 100 years. PC John George Huck (1891-1964) was born in Hayton, Cumbria. He joined the Police Force in 1912. In 1914 he resigned from the Force to join the army when the First World War broke out. In 1919 he married, and also rejoined the Police Force. In 1935, 1936 and 1937 PC Huck won the Cumberland and Westmorland Constabulary Challenge Cup for Walking. He was stationed at various places before moving from Pardshaw to Lorton in 1937. The Police House in Lorton was built in 1936, but took six months to dry out. So PC Huck and his wife and six children didn’t move in until May 1937. Mrs Jean Woods who was the youngest member of the family was the only one of their children who attended Lorton School. The older children went to school in Cockermouth, using the bus which George Scott ran. Jean remembers walking from Pardshaw to Lorton and back with her Mother to measure up for curtains while the house was still drying out. She says the house itself was very square to look at. It had electricity, mains water, a telephone (candlestick type) but no mains sewage. That came to the village a year later, in 1938. The house had three bedrooms, two with very small corner fireplaces, a bathroom and separate toilet. Downstairs the lounge had a slightly larger corner fireplace, and an office to the left of the front door. The living room had a tiled fireplace and the airing cupboard. Leading from this was a larder and scullery with a Belfast sink and a ‘copper’ which was near to the back door. The garage was metal with a concrete path between the house and garage. PC Huck’s duties covered an extensive area from the tops of Whinlatter Pass, Newlands Pass, and Honister Pass to Ullock and the crossroads at Hundith Hill. This was mostly done by bicycle. The duties were varied, including carrying out first aid when local people had accidents such as falling from roofs and walls. If necessary Huck would splint them up before they went to the local hospital. Duties also included dealing with stolen chickens but there were no sheep rustling incidents in his time. In those days when the sheep were dipped several forms had to be filled out requiring information including the breed (which were mainly Herdwick and Swaledale), and the size of flocks the farmer kept. Some farmers who were unable to write would go to the police station to receive help in filling out the forms. One day a couple came to the door of the Police Station while PC Huck was out. The lady did all the talking as her husband had lost his teeth swimming in Crummock. They had been told to contact the local ‘Bobby’ because he was a good swimmer. On his return to the station PC Huck went straight to Crummock with the couple and was shown the spot where the man had been swimming. He had to dive down quite a long way but managed to retrieve the teeth much to the relief of the couple. When war started in 1939, the Police House became headquarters for the LDVD, then the Home Guard. The rifles were kept in a rack in the office. PC Huck was also responsible for helping with the evacuees who arrived from Newcastle. Most of them had never seen green fields and cows before. When an aircraft crashed on the fells, PC Huck guided the rescue crews to the area. 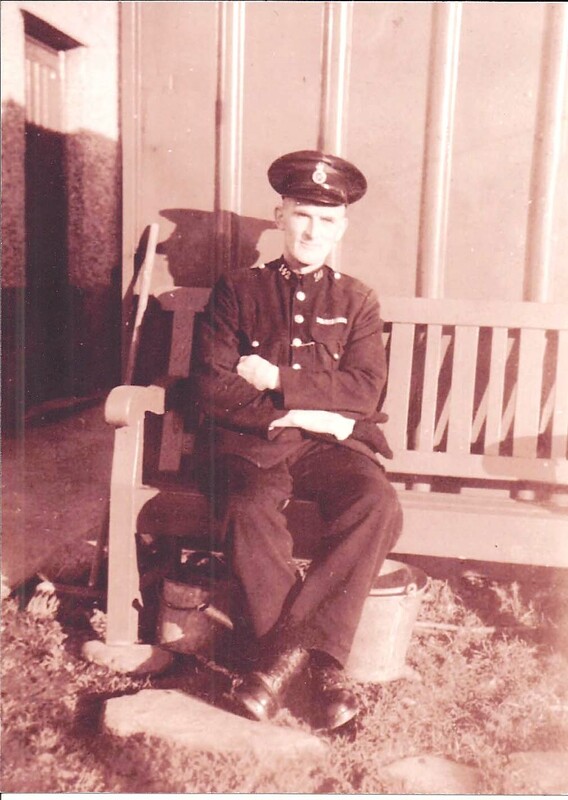 In 1946 PC Huck retired from the Police Force and he and his wife went to live in Silloth. Following his death in 1964, he was buried in Lorton Churchyard. PC David Newton was the last Policeman to be stationed in Lorton and lived there from 1979 to 1992 . He and his wife Barbara were both brought up in Keswick. His mother was a Porter and had relations already living in Lorton village. Their two children attended Lorton School. PC Newton served his two years probationary police training in Workington immediately before being posted to the Lorton country police station. His patch included the whole of the Melbreak Communities area, plus the Embleton valley. At the time there were five country police stations around Cockermouth. Newton’s duties included filling in for the other stations when the need arose. Newton dealt with a variety of enquires which came into the Police Station office. When he first arrived at Lorton he dealt with firearms and shotgun certificates before that duty was centralised in Penrith. Work included dealing with anything from traffic offences, thefts from cars to more serious crime. Occasionally there was a body in the Lake (Crummock) or suicide cases, such as hanging in the woods, to deal with. There were a few disruptions with the Melbreak Hunt when anti-hunt protestors arrived on the scene. Newton also assisted the Mountain Rescue teams when anyone was injured or killed.